Biotensegrity represents a paradigm shift in the way that we think about biological structures and the human body and completely abolishes the idea of levers. Levers have been around for more than three-hundred years, since Giovanni Borelli compared the anatomy of movement with man-made machines of the day and wrote a book (1680) describing them as an explanation for joint motion, and his ideas have persisted up until the present day. However, while this theory has been useful in the design of artificial joints, limbs and robots, it has actually told us little about the biology itself. The problem with levers is that they generate bending moments, shear stresses and stress concentrations, and it is most unlikely that developing tissues would be able to withstand the disastrous consequences of these. Levers rotate around fixed fulcrums yet bones follow complex helical pathways during motion. In addition, the nervous system is incapable of controlling the huge complexity of joint movements on its own, which thus leaves a massive gap in our understanding. 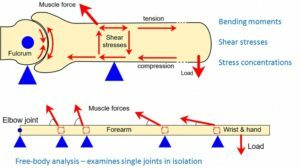 Modern biomechanics examines joints in isolation using a system of finite-element analysis, the free-body diagram and classical mechanics to simplify everything down to some semi-arbitrary minimum using data that is frequently the result of guess-work. It ignores the shear-stresses, disregards the connective tissues that link the joints together, fudges the energy-efficient, non-linear dynamics of living tissues and ignores the lack of an adequate control system (see TMJ dysfunction page). Lever theory is based on the laws of classical mechanics as formulated by Galilei, Newton and Hooke, amongst other, but these rules were discovered on inanimate objects and they don’t apply to the non-linear dynamics of living tissues. While it is well known that the results of these mechanical analyses are just simplified approximations, they are frequently quoted as representing the reality of biological structure. So, what started off as a theory of human movement that has never been proved, has become established as a principle of biomechanics simply because there has been nothing else to replace it – until now. There is nothing wrong with classical mechanics but its application to biology is mostly contrived and out of date! Biotensegrity is different because it is based on the fundamental rules of physics first and from which everything else is derived (geodesics and simple geometry). It is a structural design principle that describes a relationship between every part of an organism and the mechanical system that integrates them into a complete functional unit. A simple re-evaluation of anatomy as a network of structures under tension and others that are compressed; the bits that pull things together and those that keep them apart; basic physics! Geodesic geometry – where these forces always act in straight lines. The efficient close-packing of multiple components into the smallest amount of space. 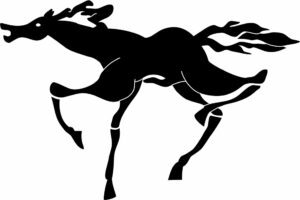 Minimal-energy – where everything reduces itself down to the simplest possible state. The balance of tension and compression. The tensioned network with the compression elements suspended within it. The integration of each part into a complete mechanical unit. Structural heterarchies (and hierarchies) at multiple size-scales. A mechanism for dissipating potentially damaging stresses and rendering them harmless. 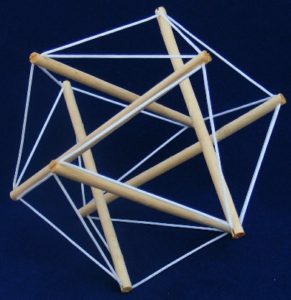 While the geodesic geometries of the platonic solids and tensegrity models are sometimes dismissed as being too simple an explanation of complex biological structure, let alone have relevance to biomechanics or any practical application, the above summarizes some of the benefits of the biotensegrity model; and all these pages are elaborating on this. Biotensegrity is an energy-efficient structural system that replaces the outdated biomechanical model from three hundred years ago and enables complex biological organisms to be understood in terms of some simple rules of physics.